Caretakers of one Indiana’s largest remaining tracts of old-growth forest are preparing for the inevitable effects of the emerald ash borer, mapping the location every ash tree so they’ll know where to expect openings in the canopy. Ginn Woods is a 160-acre expanse of Eastern deciduous forest in Muncie, Ind., owned by Ball State University used for research and environmental education. It was under single-family ownership from 1830s until the 1970s, when it was transferred to the university. It’s one of the largest stands of original forest in Indiana, where the flat landscape and fertile soil led to widespread clear cutting to make way for crops. Taylor, whose background is in forest ecology, said a previous survey in these woods showed that around 9 percent of the trees were ash. Given the emerald ash borer invasion that has already killed at least 50 million ash trees across the United States and Canada–and was confirmed in Indiana in 2004–it’s a safe bet that the Ginn Woods ash will be dead in a matter of years. Along with Stephanie Schuck, a master’s student in Ball State’s Natural Resources and Environmental Management program, Taylor used ArcGIS mapping software to create a 30-meter grid over the area and calculate the center of each square. 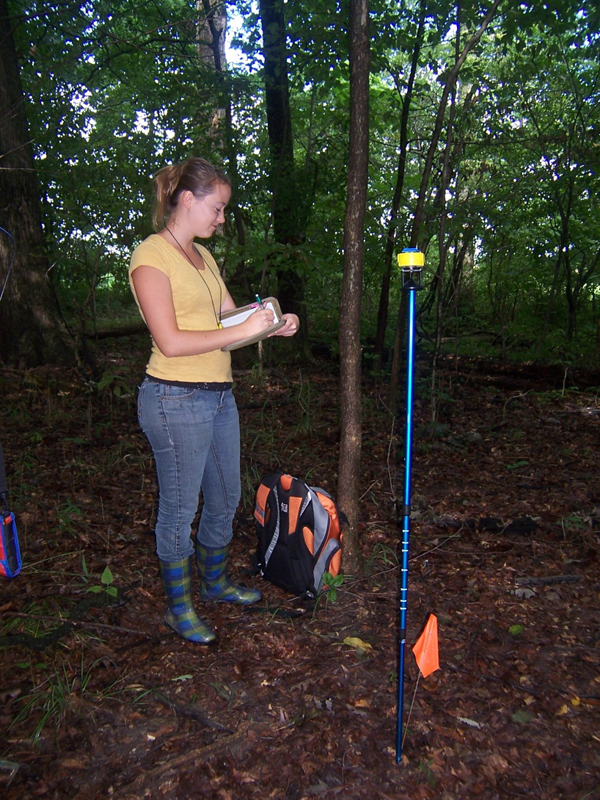 Throughout the summer of 2012, Shuck lead Taylor and team of assistants into the woods with a PDA loaded with the ArcGIS data and a Geneq SXBlue II GPS receiver. The GPS receiver helped them locate the center of each square in the forest, from which point they could log the species, size and relative location of every tree in the square. Having a good GPS receiver is important because working under the canopy increases the potential for error. Even with the SXBlue there was a potential uncertainty of around a meter or two. That means it’s possible that someone could return with a more accurate GPS and find trees slightly out of place. But that shouldn’t throw anyone too far off and the data are easy to correct. 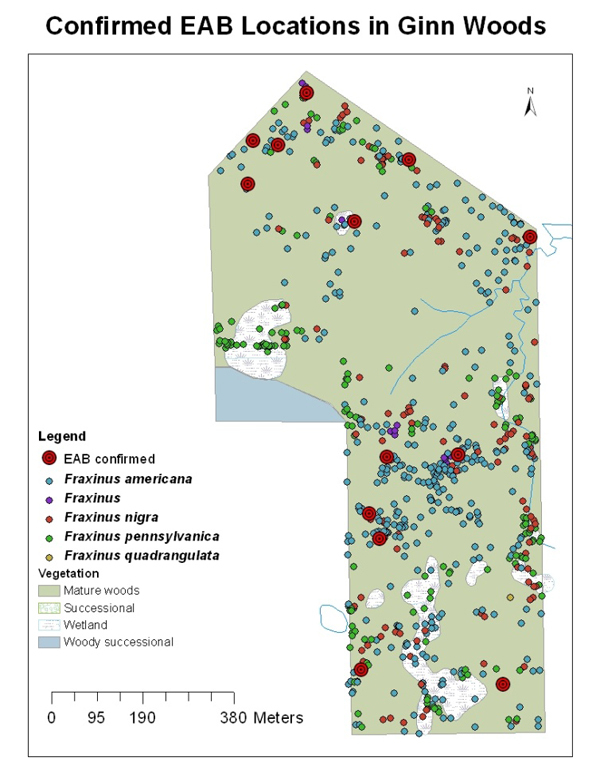 After 660 squares and 4,500 trees mapped, Taylor and Schuck came up with a dataset that will help them know what to expect when the infestation takes its toll. Out of the 300 ash trees on the map, 11 already show signs of ash borer damage. “We caught it right at the beginning, but it’s going to come through and we’re going to lose all of the ash trees,” Taylor said. The data will have applications beyond ash planning, Taylor said. It’s available for other scientists to use as a reference during their research, whether their studies are tree related or not. He also has plans to produce something like street map for the forest that visitors can load on their smartphones while on a walk in the woods. That will all be thanks to Taylor and Shuck’s walks in the woods, which weren’t all pleasant, as the summer of 2012 was brutally hot in Indiana.